Pittsburgh is a great city for running, with lots of variety. 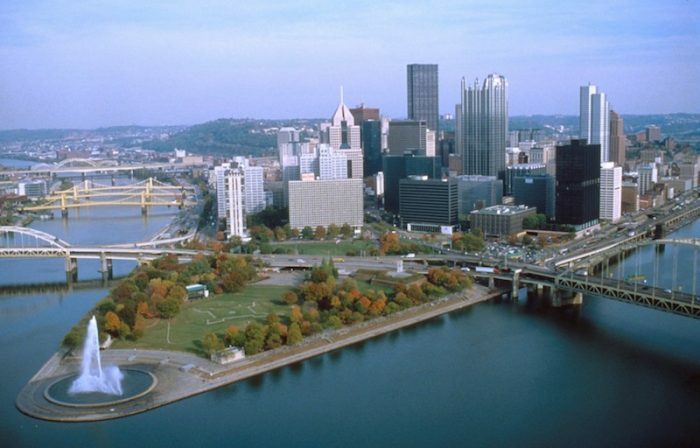 The “Steel City,” named due to its previous prominence in the steel industry, boasts city running along three rivers, many parks and trail runs, and hills, including a view of the city from the top of Mount Washington (elevation: 1123 ft). 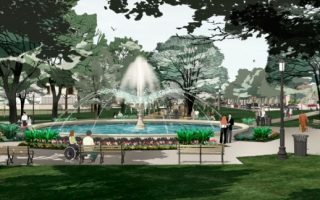 The Heritage Trail, sort of like the Charles River Trails in Boston, is downtown and takes advantage of the convergence of “three rivers”, with numerous options for good loops. Another favorite area, near downtown, includes lovely Schenley Park, Frick Park, and connecting neighborhoods. 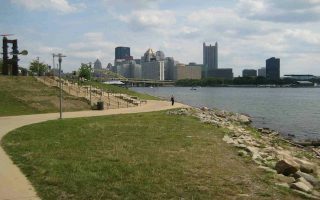 There are other park runs and challenging hill runs easily accessible, especially on the “south side” of the Monogahela River. Note: running in Pittsburgh can be hilly! The signature running option in Pittsburgh. 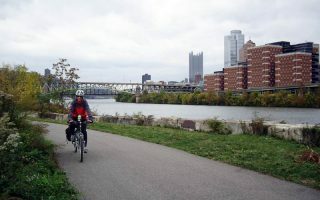 24 miles of trail, along both sides of all three rivers in Pittsburgh.There are three main ‘sections’ of the Heritage Trail, with bridges connecting the downtown core to the north and south sides. 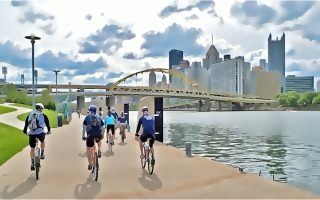 This route mostly follows the 7-mile continuous stretch of the Three Rivers Heritage Trail that covers the Strip District and the North Shore sections of Pittsburgh, running by most of the major tourist attractions within the downtown area. A classic Pittsburgh run, combining pleasant riverfront paths and the city's grittier north side, which includes passing by the Allegheny County Jail. 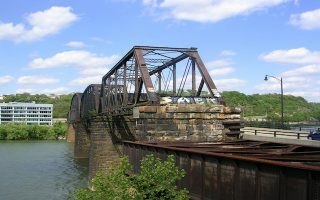 This section of the Three Rivers Heritage Trail runs towards the south side of the city along the Monongahela River. Views of the verdant Mount Washington hills. Pass by the The UPMC Sports Complex and the Pittsburgh Steelers' practice facility. Three miles from downtown, there is great running near The University of Pittsburgh and Carnegie-Mellon University. 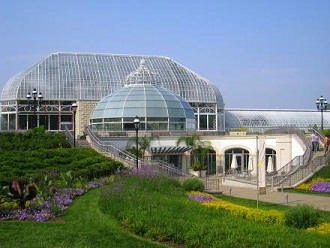 A highlight is Schenley Park, with 456 acres of trails, the Phipps Conservatory and Botanical Gardens. 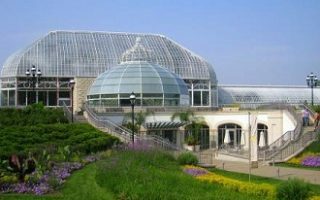 A great run combining Schenley Park, with its botanical gardens, golf course, ice rink, and pool, and Frick Park, which has 400+ acres of mostly wooded trails. 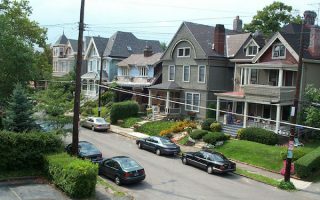 The lovely Squirrel Hill neighborhood connects the parks. Create your own route on the side streets of these adjacent residential neighborhoods. Quieter, tree-lined streets with nice older homes and small commercial areas. The Lawrenceville section of Pittsburgh, 4 miles from downtown, is near many of the city’s hospitals and is a good area for running, including Highland Park and the Allegheny Arsenal. The highlight of this run is a climb to the Mount Washington Overlook, with great views of the Pittsburgh skyline. Starts from downtown. A good option near the airport. 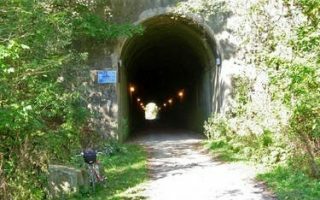 The Montour Trail runs 46 miles around the southwest part of Pitsburgh and to some of the neighboring communities. A connector trail to the airport was completed in 2012. Great Allegheny Passage, Riverview Park, and North Park Lake are some great running options near the city. 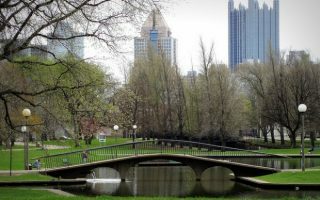 Pittsburgh’s climate is similar to most northeast states: cold in the winter months, moderate in the spring and fall, and hot during the summer. Temperatures peak in July, with an average of 10 days over 90°F annually. During the summer months of July and August, the best time to run would be in the early morning before the heat proves too brutal. Pittsburgh is a fairly compact city. There are great places to stay within proximity of the best running routes. 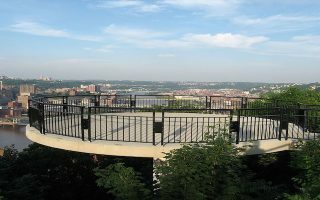 The largest cluster of hotels is right downtown, providing good access to the Three Rivers Heritage Trail. There are also hotels on the north shore, which has access to the Heritage Trail and many of Pittsburgh’s cultural and sports attraction. 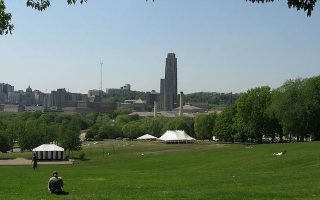 The University of Pittsburgh/Carnegie Mellon area is also a good area to stay, with good running in Schenley Park and Frick Park, and pleasant residential neighborhoods. If you need to stay near the airport, a good running option is the Montour Trail. For access, stay in one of the hotels south of the airport along I-376 rather than north. There’s also a 6-mile connector trail to the Montour Trail from the airport! There are surprisingly few dedicated running stores in the downtown Pittsburh area. Best bets near downtown are True Runner and New Balance. Fleet Feet, a great running store chain, is 8 miles south of downtown. Fleet Feet Sports — South of downtown Pittsburgh, Mt Lebanon area. Finish Line — Three locations: South Hills Village Mall, south of the city; The Mall at Robinson, between downtown and the airport; Homestead, located inside Macy’s. Steel City Road Runners — Pittsburgh’s biggest running group. Group runs Tuesdays and Thursdays at 6:30pm, Saturday and Sunday mornings at 8:30am. People Who Run Downtown — Runners of all abilities meeting weekly, Tuesday nights at 5:30pm at various restaurants. The Greater Pittsburgh Road Runners Club — Oldest running club in Pittsburgh, since 1974. Meet multiple times per week with many road races scheduled. Check website for meeting times. 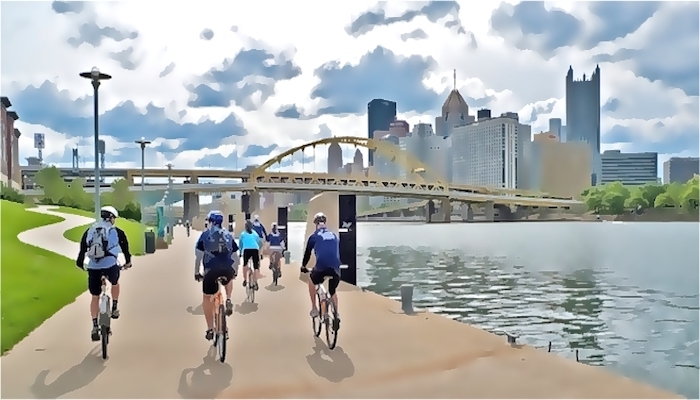 Fittsburgh is a great site promoting fitness and a healthy lifestyle in Pittsburgh. Lots of info on running, events, and other recreational opportunities. Richard S. Caliguiri City of Pittsburgh Great Race — Last Sunday of September. 10K run, 5K run, 5K walk. Over 11,000 people run the 10K every year. Walk the Talk for Liver Health. First Sunday in October. 5k run/walk at The Great Allegheny Passage at the Waterfront in Homestead. Spring Thaw 10, 15, or 20 miler — Held every year in late February as a warm-up for the Pittsburgh Marathon. Three long races held at the same time. Just a Short Run — Late March. Another combination event. Given the distances to choose to register for are 5K, 8.1 miles, half marathon, or 30K road race, the name of this event is slightly ironic. Celebrating its 16th consecutive year in 2016, this event benefits The Leukemia &Lymphoma Society. Pittsburgh Penguins 6.6 Mile Run and Family Walk — Early October. This odd distance is a tribute to Pittsburgh Penguins hockey Hall of Famer Mario Lemieux (#66), and benefits the Mario Lemieux Foundation and the Pittsburgh Penguins Foundation.